Fresh Tomato Recipes for that Glut! These fresh tomato recipes are great for when you face a tomato glut. 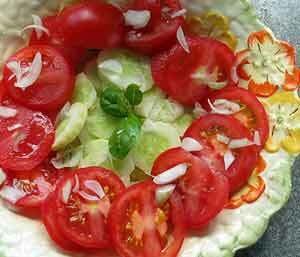 Fresh tomato recipes: Tomato salad with cucumber and basil. See below for the recipe. With the difficulties faced by many amateur tomato growers in countries where conditions are not-so-perfect, you might be forgiven for thinking a full-on tomato glut will never happen to you! Growing tomatoes is not so very easy in a cool, damp climate. But, sooner or later, if you carry on growing your own organic tomatoes, (despite the trials and set backs) everything comes good and you get a decent crop. A few summers ago the growing conditions for tomatoes were good and we had planted a lot of the variety Moneymaker, which lives up to its name by being a heavy cropper but is a bit lacking when it comes to flavour. We had more tomatoes than even we could cope with, even after giving loads away, so we searched for a decent soup recipe which was suitable for freezing. Here's what we found and adapted to our own tastes. This first fresh tomato recipe is a very easy soup recipe that you can vary by adding garlic, herbs or by using dry white wine or sherry in place of vinegar. Garlic - makes it very tasty indeed! Onions - chop fine and sweat in a tablespoonful of oil for five minutes before adding the tomatoes. Olive oil or butter - good if you are using garlic or onions and produces a richer soup. Tarragon and basil both go well - add a chopped handful of either at the start. Take a kilo of ripe tomatoes. Pierce the skins so that the juice will run out easily as they heat up. Add two tablespoonfuls of cider vinegar. Add salt and ground pepper if you like. Heat the pan gently for five minutes or so. Let the contents cool and then liquidize everything. That's it! Don't remove the skins as this is where a lot of the flavour is. If you have a reasonable food processor the skins should not trouble most people. Otherwise, you can fish them out just before serving if you wish. The easiest method is simply to sieve the soup or pass it through a fine mesh net. You can also carry on reducing this preparation until it is thick and creamy and use it as a stock or sauce. It can also be frozen once it has cooled. You can serve it as soup with a swirl of fresh cream. Fresh toasted croutons are very good too. Tomato salads are very easy and of course there are any number of variations. Tomato salad with basil and sliced halloumi cheese is a classic. Tomatoes and cucumbers sliced with a fresh scattering of coriander and olive oil is great, too. Try adding a few capers for a nice twist. You will get the best results if you use premium organic tomatoes, grown from heritage seeds. This will deliver tomatoes which are bursting with flavour - which is what you want when making salad. Halloumi is available from many middle eastern stores and bigger supermarkets. It is a cheese from Cyprus which is a little like mozzarella but rather tastier. It is traditionally made with sheep and goats milk. This is a fabulously easy stand-by recipe for a quick lunch or entree. Fry some garlic in olive oil or butter. Add sliced or chopped tomatoes and cook gently for a few minutes. Add a few chopped anchovies and heat through. Pour the mixture onto ready buttered toast. 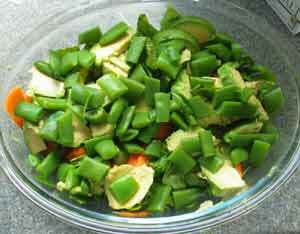 You can vary it by using other oils and adding onions, or green beans, or any other quick-cook vegetables. Melted cheese is also worth considering and can replace the anchovies. Sustainable anchovies are available from "Fish4Ever". Serve with a green side salad. This recipe is especially delicious with black pepper. Tomatoes are now being recognised as a fabulous source of health-giving nutrients such as lycopene, which is a great aid in preventing cancer cells from forming. It's no bad thing to eat plenty of them as often as you can. Tomatoes just grilled on top of toast are also quite delicious and even quicker than the recipe above! Just toast a slice or two of bread, leaving the second side only very lightly toasted. Butter the toast and add sliced tomatoes. Put the toast back under the grill for a couple of minutes and it's ready. Lovely with fresh ground black pepper. In France they do a similar dish where they rub the tomatoes into the bread first, before lightly toasting the bread. In Italy bruschetta with tomatoes is a common antipasto dish. Basil and garlic are used to enhance tomatoes and oil on bread. Make pancakes in the usual way - 1 egg broken into a dip in the middle of a small heap of flour. Add milk or dried milk + water until you have a smooth batter. (A proper balloon whisk is invaluable for avoiding lumpy batter.) Ideally, set the batter aside for half an hour in the fridge, or other cool place. Heat a couple of teaspoonfuls of oil and make the pancakes. Use a spatula to turn the mix frequently and as soon as the tomatoes are a little cooked and the cheese is a little melted, turn the mix out onto the pancakes and roll them up. 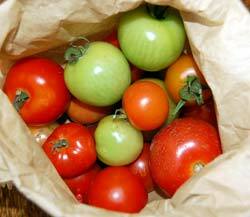 See Growing Tomato Plants for some tips on how to succeed with homegrown toms.